It looks like the popular tv series ‘Spartacus’ on the Starz network is coming to and end with its upcoming 3rd season titled ‘Spartacus: War of the Damned’, however don’t fret too much as Starz is looking to make a spinoff series based on Julius Caesar. The Julius Caesar project will be helmed by Robert Tapert, who was the head honcho on Spartacus and of course in cahoots with Sam Raimi on the ‘Evil Dead’ films. 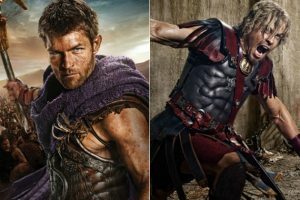 The third season of Spartacus will start January 25th and will introduce Julius Caesar, played by Todd Lasance, which if done well, could be a great starting point for the spinoff series.I have a feeling Caesar will do well as over 6 million viewers tune in for each episode of Spartacus already. For you Spartacus fans, this looks to be the best season yet, with a very cool spinoff series in the works. Starz Adapting Italian Gang Series ‘Romanzo Criminale’!!! This entry was posted on Thursday, November 29th, 2012 at 10:45 am	and is filed under News, Television. You can follow any responses to this entry through the RSS 2.0 feed. You can skip to the end and leave a response. Pinging is currently not allowed. « Check Out This Viral Video of Guillermo Del Toro’s ‘Pacific Rim’!! !